I'm really no expert at design or anything.. so I guess this came out okay for me. Not that I intend to use it or anything, but it was fun. I might make more later if I come up with any better ideas. Hey dude, was wondering if I could borrow this image for my mixer logo? I will alter color but that is it. hi, it looks really cool, do you mind if i made the 3D printable version of this, and upload on thingiverse.com ? will put ref. for your page. This design is amazing, can I use it as a tattoo ? 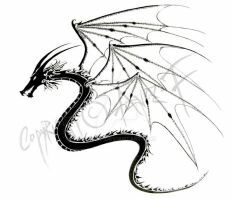 A friend of mine is looking to get a tattoo and really loved your dragon's body. 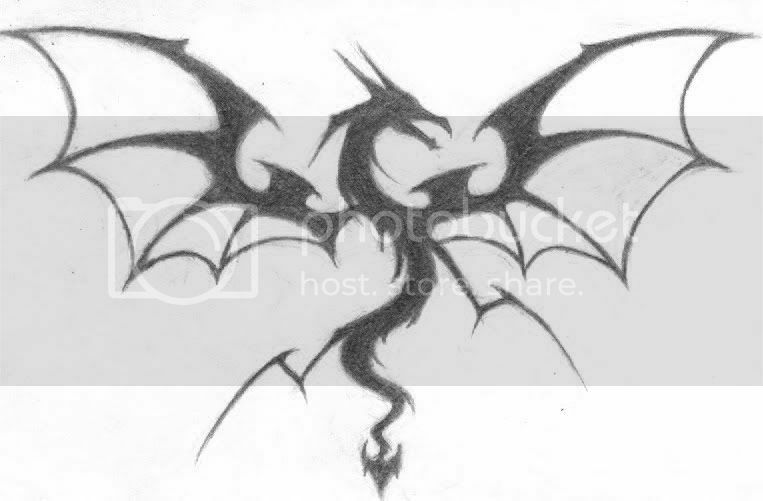 She asked me if I could do some Photoshop magic with them and another artist's dragon design, so I did as she asked, and she really loves the composition I came up with and wanted me to ask if you would mind if she got the tattoo I put together, considering it does contain part of your art. If I post the image here on DeviantART, I will of course link back to your original giving you credit, and the design will be personal and non-commercial. I like it. Can I use this one as a sticker for my windsurfing sail? Can I use this for a project? I love it! You can check out what I do here if you want! Hey man... this is cool... can I use it for my next Tattoo?? I wanted to use it for my back. I clicked the picture to get the HUGE version, but I couldn't save it... is there anyway you could send it to me? yeah sure, I'm honored that someone actually wants to use this as a tattoo... Just be sure to send me the pic if/when you actually get it tattooed on your back, I'd really love to see it! I can send a .jpg version to your email if you want, just drop me a note with your email address. Not to copy the post before the last. Ill take a bunch of wood and make them into difrent pieces and make it a real dragon that you can mount on the wall. My teacher did the same with a butterfly. Im making this into a woods project, if you dont mind. Okay, so an odd comment. It would make a cool wood carving. I've done carvings where you take a flat surface and carve away the background, leaving only a silhouette. Your dragon would be realy good for that. Uh, that means I like it. I talk to much. !! Ooooh this is gorgeous! It's so clean and crisp...and I always love dragons. x3 I think its a wonderful design. ^^ Don't worry...I'm slow at art also. It looks great! Love the sketch too! I'm in loooove with dragons and you made this one extremly cool Keep up the good work! 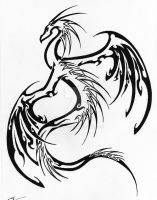 That would be AWESOME between the shoulderblades, or, on the really lower back.